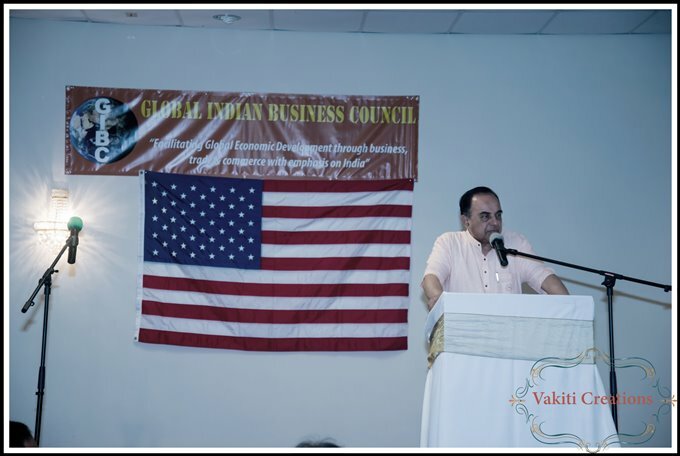 Dr. Subramanian Swamy, senior leader of the ruling Bharatiya Janata Party (BJP) and well-known economist, presented an economic seminar on Monday, August 24, 2015 at Global Mall, Norcross, GA, hosted by the Global Indian Business Council (GIBC). A networking dinner at Ashiana Banquet Hall followed. 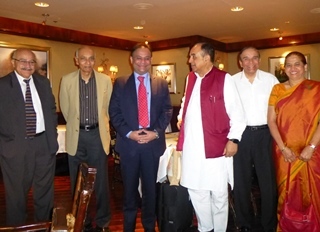 Dr. Swamy, noted for his punctuality, was on time and mingled with attendees during the social hour. Raman Gandhi emceed the evening for the audience of more than 150 Atlantans. GIBC President-elect Dhiru Shah praised Dr. Swamy for his relentless challenges to corruption in India and for his advocacy for economic reforms to liberate the Indian economy from socialist dogmas and needless bureaucratic shackles. Shah also thanked Nagesh Singh, Consul General (CG) of India, for his leadership and for making the Consulate General of India – Atlanta accessible through its outreach to the entire Indian American community in the Southeast USA. Outlining the mission of GIBC, Shah stated that GIBC was launched in 2014 in Atlanta to facilitate global economic development with emphasis on India through business, trade, and commerce. GIBC has already organized three successful economic seminars in Atlanta and one full day seminar in Ahmedabad in January 2015. To help the US and foreign companies to navigate the Indian rules and regulations, GIBC opened its first full-fledged office in Ahmedabad, India in January 2015. A second office in New Delhi is to be opened soon. Collaborations with business chambers in Australia have also been set up, and other similar ventures are in the works. GIBC VP Ashwin Patel introduced CG Nagesh Singh, remarking that CG has inspired and won hearts of the Atlanta community with initiatives within two months of his arrival. In his remarks, CG Nagesh Singh welcomed Dr. Swamy adding "Since the time I was in University, I have admired you for all the qualities mentioned by my predecessors, but I admired you most [because] you give it as good as you get." Another guest speaker, Mr. Sahil Jaggi, International Marketing Manager of Atlanta-based UPS, spoke of the global shipping company’s large and fast-growing presence in India. He praised huge improvements in customs clearance and logistics in India, and was optimistic about strides in streamlining processes and logistics. GIBC’s Subash Razdan, with characteristic humor, introduced Dr. Swamy as the charismatic and dashing American-trained professor who had inspired his generation at the Indian Institute of Technology (IIT) in Delhi during his stint at IIT as the Head of the Humanities Department in the early 1970s. Dressed in his traditional kurta (loose shirt), Dr. Swamy enumerated opportunities opened by the 18-month-old government under Prime Minister Narendra Modi. With his usual wit and candor, Dr. Swamy used deep historical knowledge and current economic figures to elaborate on his own vision of economic growth of India. He explained the importance and need for ensuring a level playing field to balance an unfair advantage to multinational companies (MNCs) due to cheap and easily accessible capital in USA and relatively cheap labor and logistics in India. He observed that US MNCs could borrow capital at 3% in USA for investment in India and take advantage of cheap Indian labor. On the other hand, India’s own small retail traders face a staggering 12% interest rate within India, rendering them incapable of competition with MNCs from overseas. Yet when it comes to allowing Indian construction companies to compete/borrow capital in the US market by bringing with them their own lower-paid workforce from India, US immigration offices balk at the thought of cheap labor entering from India. He added, “the foreign direct investment lately has brought unique technologies and fostered innovation in India, primarily due to open heart welcome by the Indian government.” He pointed out that 65% of the growth in the European industrial revolution as well as in the more recent American electronics and communications-based industrial revolutions came from innovation, versus less than 35% of India’s Soviet-style development until 1990. Swamy emphasized that India enjoys a huge “demographic dividend” with an average age of only 26 years compared to over 40 in Europe and Japan and 37 in the USA. The challenge for India is to educate this young population and inculcate risk-taking innovations and entrepreneurship. 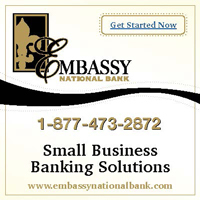 Using the Purchasing Power Parity logic, a US dollar is an equivalent to Rs. 24, which puts India among the top 5 economies in the world. With China possibly encountering problems similar to those faced by Japan for several decades in the past, India could rise to become the #2 economy, second only to the US, projected Swamy. Both the US and Indian democracies share the open, transparent structures that are vital to innovation and advancement. Dr. Swami argued for abolishing income tax in India, which mainly burdens the working middle classes and particularly young professionals. The annual loss in revenue to the exchequer from income tax cuts could be easily made up by fairly auctioning communication spectrum and coal rights at market rates. Additionally, far more investment resources could be freed by bringing back illegally accumulated holdings in offshore accounts in some 70 nations if the Government of India showed the resolve without corruption.